First Signs of Self-interacting Dark Matter? For the first time dark matter may have been observed interacting with other dark matter in a way other than through the force of gravity. Observations of colliding galaxies made with ESO’s Very Large Telescope and the NASA/ESA Hubble Space Telescope have picked up the first intriguing hints about the nature of this mysterious component of the Universe. Using the MUSE instrument on ESO’s VLT in Chile, along with images from Hubble in orbit, a team of astronomers studied the simultaneous collision of four galaxies in the galaxy cluster Abell 3827. The team could trace out where the mass lies within the system and compare the distribution of the dark matter with the positions of the luminous galaxies. 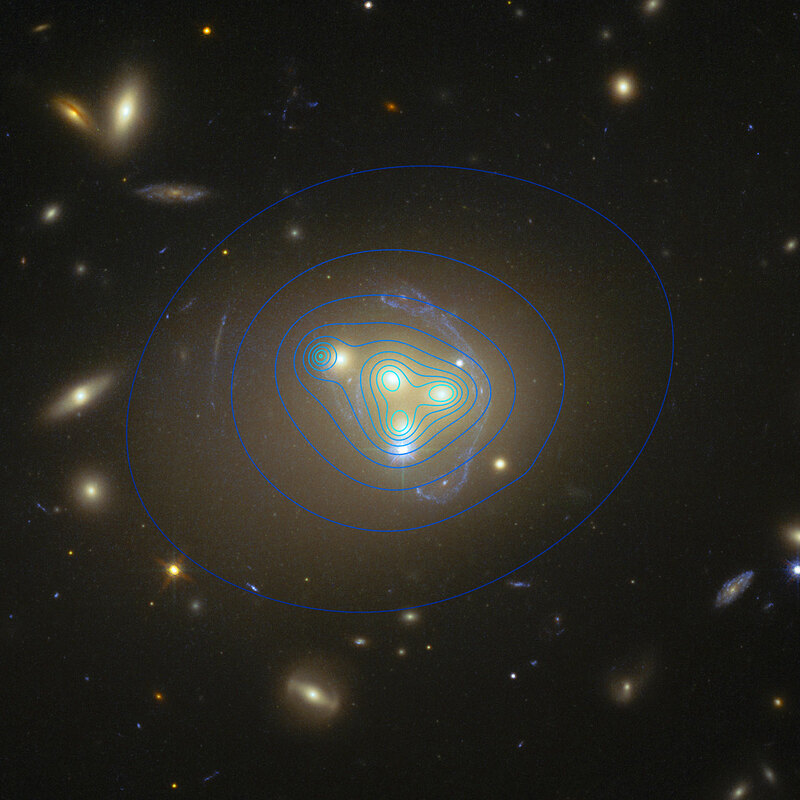 Although dark matter cannot be seen, the team could deduce its location using a technique called gravitational lensing. The collision happened to take place directly in front of a much more distant, unrelated source. The mass of dark matter around the colliding galaxies severely distorted spacetime, deviating the path of light rays coming from the distant background galaxy — and distorting its image into characteristic arc shapes. Our current understanding is that all galaxies exist inside clumps of dark matter. Without the constraining effect of dark matter’s gravity, galaxies like the Milky Way would fling themselves apart as they rotate. In order to prevent this, 85 percent of the Universe’s mass  must exist as dark matter, and yet its true nature remains a mystery. In this study, the researchers observed the four colliding galaxies and found that one dark matter clump appeared to be lagging behind the galaxy it surrounds. The dark matter is currently 5000 light-years (50 000 million million kilometres) behind the galaxy — it would take NASA’s Voyager spacecraft 90 million years to travel that far. A lag between dark matter and its associated galaxy is predicted during collisions if dark matter interacts with itself, even very slightly, through forces other than gravity . Dark matter has never before been observed interacting in any way other than through the force of gravity. The researchers note that more investigation will be needed into other effects that could also produce a lag. Similar observations of more galaxies, and computer simulations of galaxy collisions will need to be made. This result follows on from a recent result from the team which observed 72 collisions between galaxy clusters  and found that dark matter interacts very little with itself. The new work however concerns the motion of individual galaxies, rather than clusters of galaxies. Researchers say that the collision between these galaxies could have lasted longer than the collisions observed in the previous study — allowing the effects of even a tiny frictional force to build up over time and create a measurable lag . Astronomers have found that the total mass/energy content of the Universe is split in the proportions 68% dark energy, 27% dark matter and 5% “normal” matter. So the 85% figure relates to the fraction of “matter” that is dark. Computer simulations show that the extra friction from the collision would make the dark matter slow down. The nature of that interaction is unknown; it could be caused by well-known effects or some exotic unknown force. All that can be said at this point is that it is not gravity. All four galaxies might have been separated from their dark matter. But we happen to have a very good measurement from only one galaxy, because it is by chance aligned so well with the background, gravitationally lensed object. With the other three galaxies, the lensed images are further away, so the constraints on the location of their dark matter too loose to draw statistically significant conclusions. Galaxy clusters contain up to a thousand individual galaxies. The main uncertainty in the result is the timespan for the collision: the friction that slowed the dark matter could have been a very weak force acting over about a billion years, or a relatively stronger force acting for “only” 100 million years. 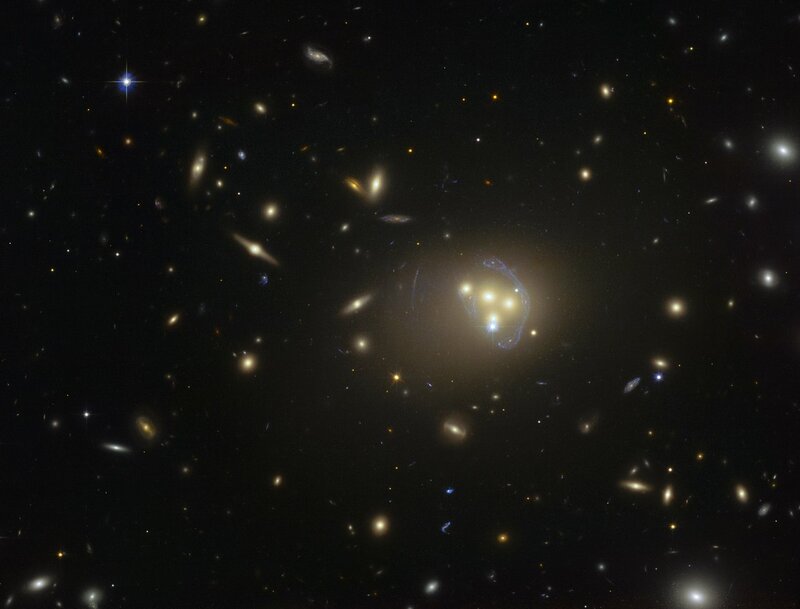 This research was presented in a paper entitled “The behaviour of dark matter associated with 4 bright cluster galaxies located in the 10 kpc core of Abell 3827” to appear in the journal Monthly Notices of the Royal Astronomical Society on 15 April 2015. The team is composed of R. Massey (Institute for Computational Cosmology, Durham University, Durham, UK), L. Williams (School of Physics & Astronomy, University of Minnesota, Minneapolis, Minnesota, USA), R. Smit (Institute for Computational Cosmology, UK), M. Swinbank (Institute for Computational Cosmology, UK), T. D. Kitching (Mullard Space Science Laboratory, University College London, Dorking, Surrey, UK), D. Harvey (Ecole Polytechnique Fédérale de Lausanne, Observatoire de Sauverny, Versoix, Switzerland), H. Israel (Institute for Computational Cosmology, UK), M. Jauzac (Institute for Computational Cosmology, UK; Astrophysics and Cosmology Research Unit, School of Mathematical Sciences, University of KwaZulu-Natal, Durban, South Africa), D. Clowe (Department of Physics and Astronomy, Ohio University, Athens, Ohio, USA), A. Edge (Department of Physics, Durham University, Durham, UK), M. Hilton (Astrophysics and Cosmology Research Unit, South Africa), E. Jullo (Laboratoire d’Astrophysique de Marseille, Université d’Aix-Marseille, Marseille, France), A. Leonard (University College London, London, UK), J. Liesenborgs (Hasselt University, Diepenbeek, Belgium), J. Merten (Jet Propulsion Laboratory, California Institute of Technology, Pasadena, California, USA; California Institute of Technology, Pasadena, California, USA), I. Mohammed (Physik-Institüt, University of Zürich, Zürich, Switzerland), D. Nagai (Department of Physics, Yale University, New Haven, Connecticut, USA), J. Richard (Observatoire de Lyon, Université Lyon, Saint Genis Laval, France), A. Robertson (Institute for Computational Cosmology, UK), P. Saha (Physik-Institüt, Switzerland), R. Santana (Department of Physics and Astronomy, Ohio University, Athens, Ohio, USA), J. Stott (Department of Physics, Durham, UK) and E. Tittley (Royal Observatory, Edinburgh, UK).